Águilas is located in the south-east Mediterranean coastline of Spain, with a 28-kilometre shoreline lined with sandy beaches and wild, rocky coves. 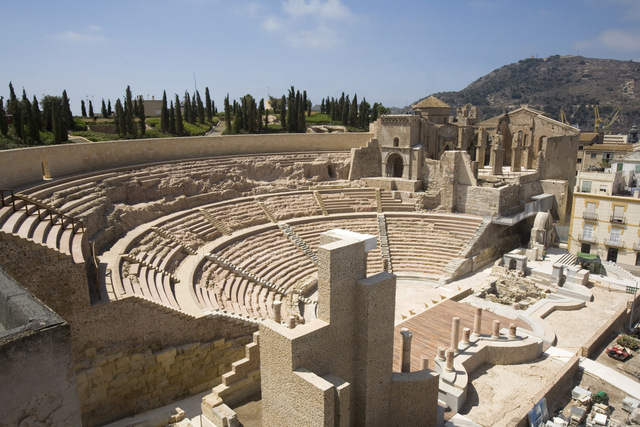 But although the town is best known for its summer beaches, Águilas has a fascinating history, with traces of the Romans and Phoenicians, through to its modern history, with important remnants from its role as a railway town and mineral shipping port. 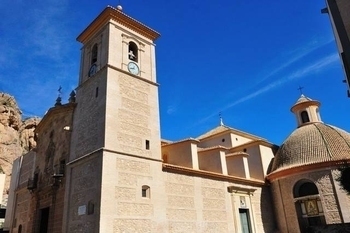 Aguilas offers an interesing tourist route, the route of the railways, visiting the most important remains relating to the railways, and is held on the third weekend of every month. 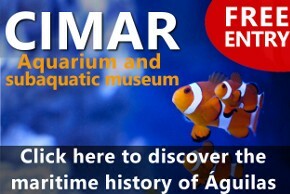 The route is open to individuals or couples who would like to learn more about the history of Águilas and is in SPANISH. Special visits can be arranged for groups with an English-speaking guide (see end of info below for more details). Its a fascinating morning out and highly recommended, and is best rounded off by an excellent and well priced lunch afterwards. 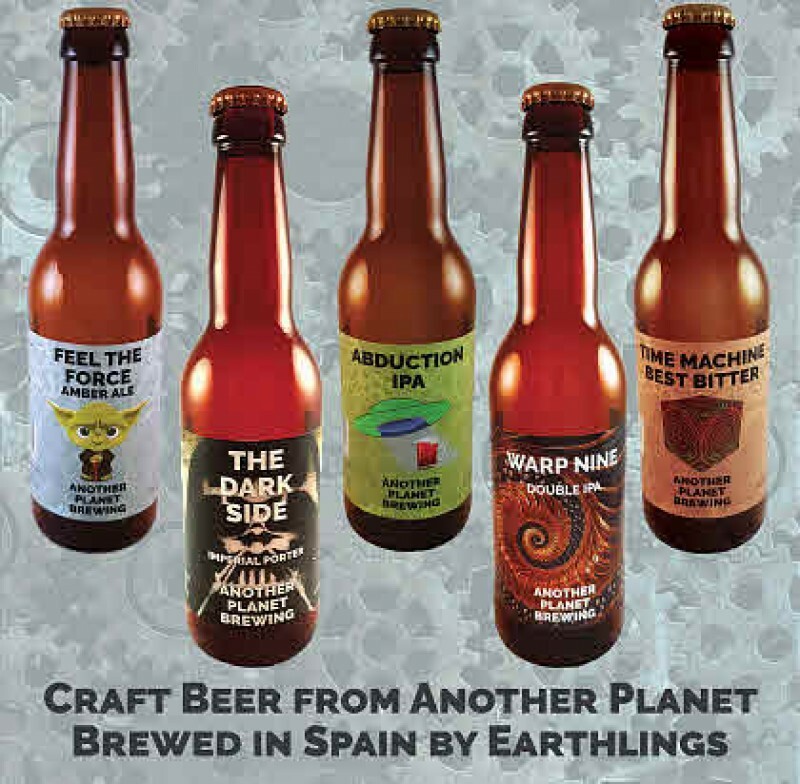 This article can be printed off by anyone intending to go along who doesn´t speak Spanish and would like to follow the route. Between 1875 and 1884 improvements to the port infrastructure were carried out, making Águilas capable of processing large quantities of materials as iron extraction gained pace towards the end of the 19th century. The logistics of transporting the volumes of iron ore extracted made the construction of a railway the most logical option connecting the mines with the coastline, sea transport offering the most practical way in this era of transporting large volumes of raw materials. 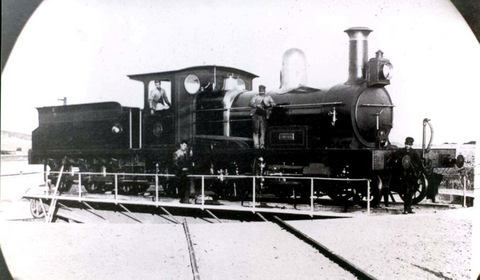 Between 1887 and 1890 The Great Southern Spain Railway Company built the line between Lorca and Águilas, with a connection to the Granada line in Almendricos. 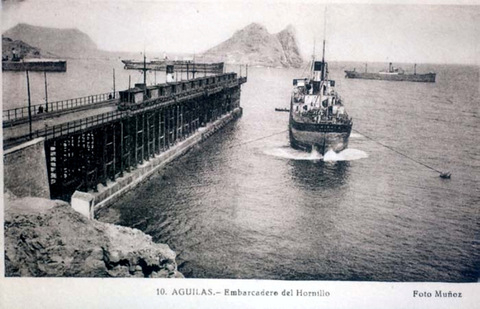 In 1903 the same company was responsible for the construction of the Embarcadero del Hornillo, the main wharf or jetty in Águilas. 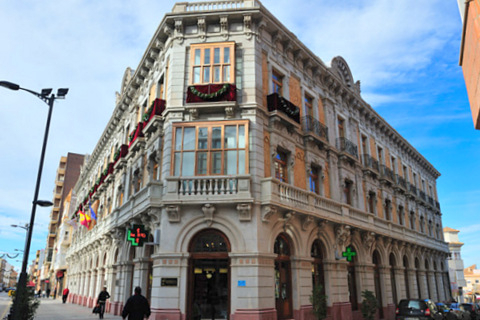 Having initially been set up in 1885, the company continued in operation until 1941, and in 1907 built the Murcia-Granada line, passing through Guadix and Lorca. This activity transformed Águilas into a prosperous town, with a good number of international residents and their families involved in activities relating to the mining and railway activities, hence the construction of the casino and other important buildings. 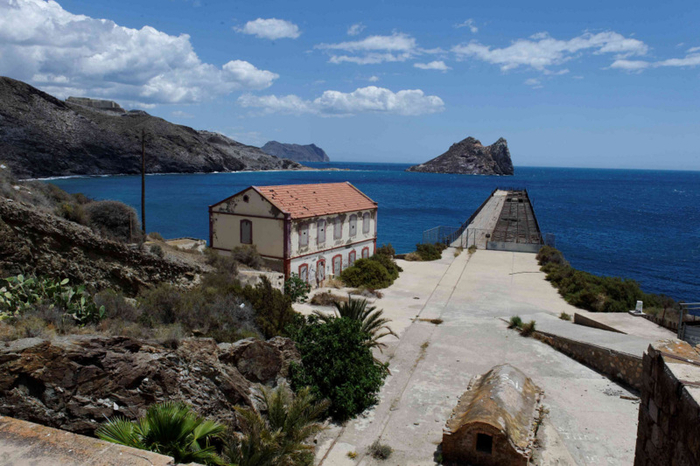 The route begins in the port, at the site of the old Águilas-Puerto station. 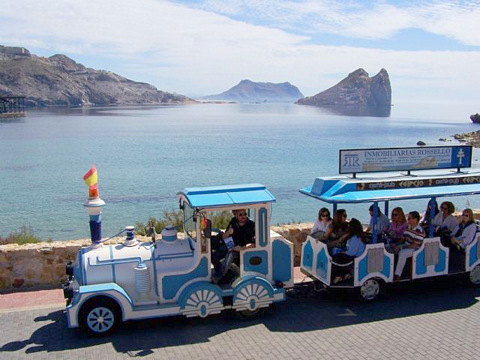 The first stop is at the Monumento al Ferrocarril, the train which commemorates the mining history of Águilas, a tourist train taking visitors along the sea front to the Puente de la Rambla de las Culebras (the bridge which crosses the rambla.) From here visitors walk along the Sendero del Hornillo, which passes through the tunnels and storage deposits for the minerals, out to a viewing pont from which the Embarcadero del Hornillo (the vast loading pier from which minerals wre loaded onto boats) can be viewed from above. Visitors then re-board the train and travel across the Pontón bridge to the Playa de los Cocedores del Hornillo, to see the Embarcadero from below. From here the route continues along the Playa de las Delicias to the Renfe station and the Museo del Ferrocarril, the railway Museum, and then to the Casa del Huerto de Don Jorge. Finally the tourist train returns to its starting point, following the route of the old tracks. 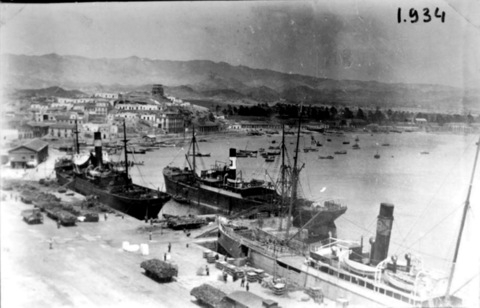 In the 19th century, bulk transport was usually by sea, and Águilas was a busy shipping port, loading not only minerals, but other goods and passengers onto ships. 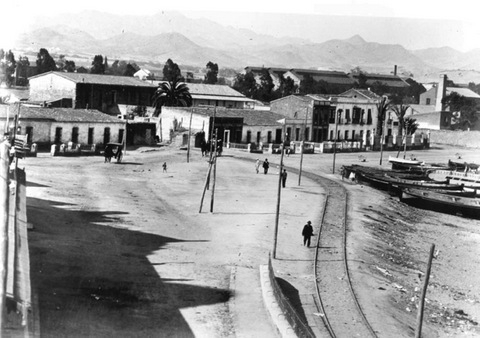 In the past, once trains had reached the main station in Águilas they would be sent either to the Embarcadero del Hornillo or to the Águilas-Puerto station. Cargos of iron were mainly sent to the Embarcadero del Hornillo, while the Port station would receive shipments of marble, esparto grass (a very important export product used for making ropes prior to the invention of synthetic materials) and similar products. The Águilas-Puerto station was also used by passengers at the time. The station occupied part of the large shed and warehouse used by the railway for storing carriages, and was divided into two parts: one for the work going on in the port, and the other for the rail company. This monument consists of an old locomotive, which was built in 1889 in Glasgow. It was brought by ship to Águilas and assembled in the workshops of the British rail company in the town, officially coming into service on Sunday 1st April 1890. Testimony to the quality of its build is that it remained in active service until 15th November 1967. It was used to haul trains carrying passengers and freight (marble, esparto grass and tomatoes), as well as the “Yanki” trucks containing iron ore (nicknamed thus due to the wagons having been built in the USA). The engine was officially donated to the town of Águilas in the summer of 1969, and the following August it was placed on a pedestal in its current location. It has several very interesting features, such as the chutes which dropped sand down onto the tracks in front of the wheels during torrential rain, stretches of the track being so steep, that sometimes the trains slipped backwards when they were fully loaded with ore. It also has very powerful lights, as, at times, a man would have to walk in front of the train checking the track for rockslides and debris. Ore production was incessant, in spite of the harsh weather conditions in the mining areas, which suffer snow and frost in the winter. This bridge was built in 1901 to provide a connection between the loading jetty and the railway station, crossing the rambla in order for the rail link to avoid damage from floodwater in the event of heavy rainfall. It is 42 metres long, and is 450 metres from the jetty. 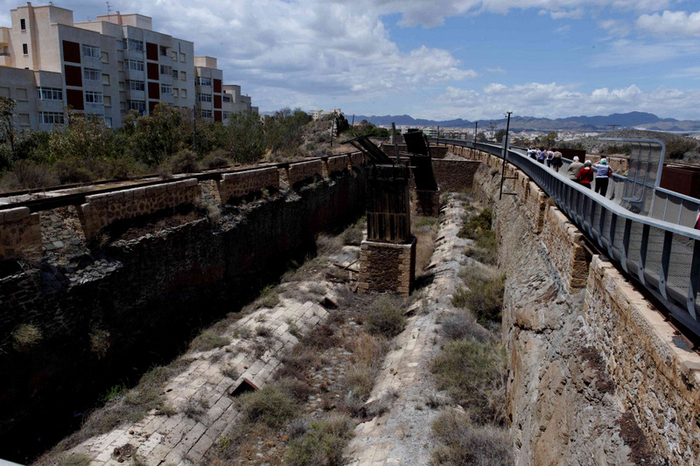 This path runs from the Puente de la Rambla de las Culebras up to the Mirador (viewing point) which overlooks the Embarcadero del Hornillo and runs through the workings which supported the loading of ships from the loading jetty below. The whole area is in an excellent state of preservation and provides a fascinating insight into the workings of the loading docks, and gives an idea of the sheer scale of these operations. The upper tracks are on the surface of the hill, above the tunnels, where the path now runs. They run in parallel on stone walls which were also used as the containing walls for the mineral deposits. 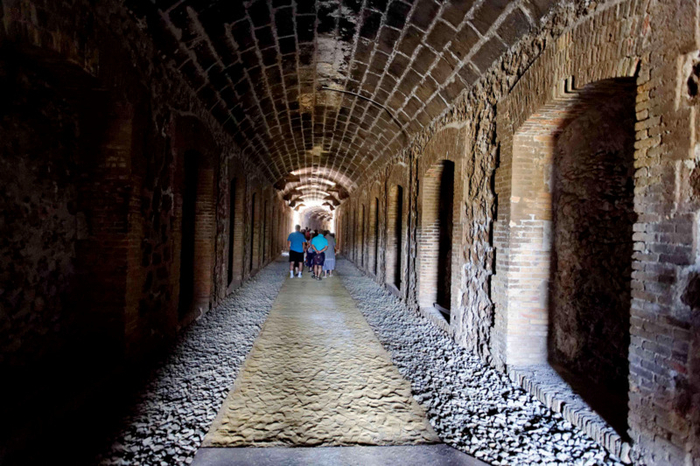 The mineral deposits were used in order to ensure that there was a constant reserve supply of minerals, on top of the quantities which arrived in Águilas every day. There were different areas for each type of mineral and the deposits owned by the different mining concessions. Minerals would be left in these areas prior to the arrival of the ships to transport them, and carriages loaded via a "blind" tunnel to ensure the docks were loading 24 hours a day, 7 days a week. The tunnels were three large galleries opposite the jetty, or wharf. These were a direct rail link into the railway network via the railway station, but also ran beneath the mineral deposit areas, so trucks could be filled easily from the stores above them to ensure maximum turnaround on the ships. Of the three tunnels which were dug out, only two were actually used for rail connections. These two were 150 metres long, while the blind tunnel is 200 metres long. There are chutes in the ceiling from the bottom of the mineral deposits which lie above, which were used to load the wagons passing through the tunnels: in the central tunnel and the blind tunnel these chutes are placed in symmetrical pairs, while in the left-hand tunnel they follow a zig-zag distribution pattern. There were also eight ventilation shafts placed along the length of the tunnels. The view from the top of the tunnels is a spectacular one, looking out over the Bahía del Hornillo and the Isla del Fraile, and down onto the loading jetty, the Embarcadero del Hornillo below. The railway wagons rolled straight out onto the jetty, discharging into the holds of the ships below. The guide said that on one occasion a train went off the end of the jetty into the sea below, and was recovered by engineers who used air bags to lift it back to the surface. Visitors walk in to the complex through the tunnels and go out above them, looking down onto the mineral deposits from above. When in full operation, these vast empty spaces would have been filled with ores waiting for onward transportation. 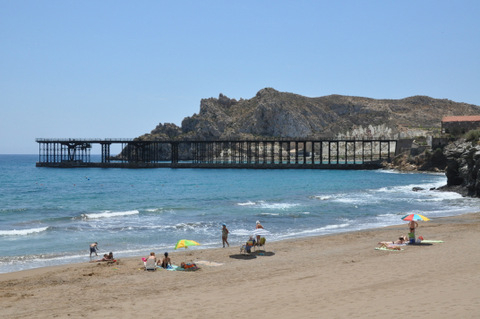 The old mineral loading jetty was designed by British engineer, Gustavo Gillman and built by the British Great South Eastern Spain Railway Company between 1900 and 1902, opening officially in 1903. At the time its cargo loading and unloading systems were revolutionary in the area, designed to be similar to those used in Huelva and Bilbao. Two boats could be loaded simultaneously and on average 3000 tons of minerals were shipped out from Águilas every day. The jetty is in need of major structural repair and can only be viewed from above or from the beaches alongside it. The floor plan of the building shows a double “T” shape, parallel to the railway track and featuring a canopy on the main platform which is supported by ten metal columns. The railway station has undergone major restoration and is still in use today. 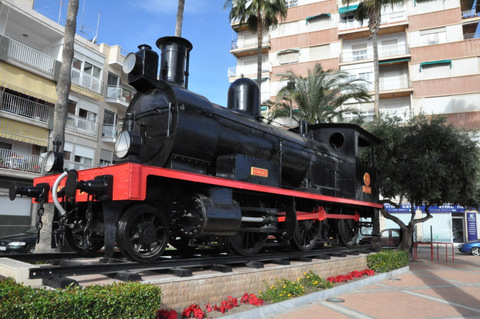 The railway museum was created in 1985 by the “El Labradorcico” railway enthusiasts club in Águilas, and is housed on the lower floor of the passenger station in the town itself. The premises used to be occupied at the end of the 19th century by “The Great Southern Spain Railway Company”, who used them as an archive and maintained their vast strongbox here, the reinforced iron door which protected the safe is still fully functional and is an integral part of the Museum today. The large main room of the museum has thick brick walls and a vaulted ceiling, with an eclectic collection of photographs and railway memorabilia relating to the history of the Lorca-Baza-Águilas line. The photographs clearly show the former port of Águilas and the people who lived and worked here. There is also a large model train exhibit which is operational whenever the museum is open. This was built in the early years of the 20th century, and was the residence of George Lee Bog and his family between 1912 and 1936. The house is of interest due not only to its intrinsic architectural value, of course, but also to the importance of its owner and his role in the development of Águilas. In 1907 the director of The Great Southern Spain Railway Co. Ltd, The Hornillo Co. Ltd. and The Bacares Iron Ore Ltd was Gustavo Gillman, and he sent an experienced and trusted henchman to Águilas. This was George Lee Bog, who started as junior manager and eventually became director in 1913. “Don Jorge” was a popular and considerate employer, and did much to help improve the lives of workers in what was a dangerous occupation, and was awarded the Cruz de Beneficencia medal for his humanitarian aid during the flu epidemic which swept across the country in 1918. In later years the building was known as the “Centro Cultural” of Renfe, as from the 1970s onwards it was used as a place of leisure by Renfe workers. 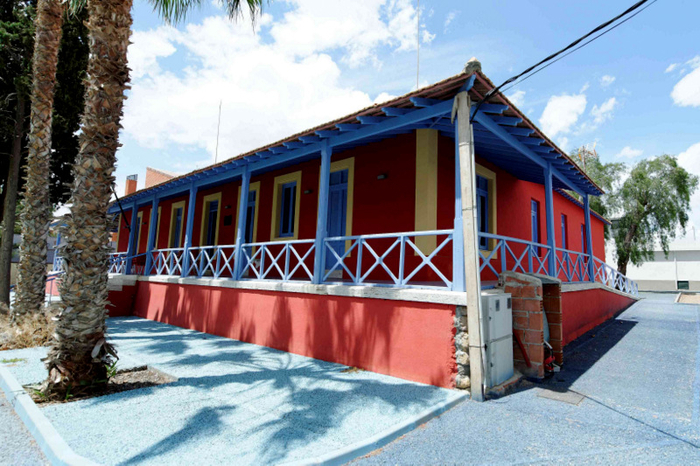 The house has now been restored by the architect Antonio Martínez de la Casa, and maintains the colonial air and essence of Don Jorge, who had spent much of his time in North America, South America and South Africa, and this explains the typical porch and the bright colours on the façade. Similar materials to those originally used have been employed in the restoration work, and the same approach has been taken with the interior decoration and furniture. One of the highlights is the ceiling of the meeting room, which was built to resemble the old ceilings of the house using a motif of intertwining reeds which was very popular in the early 20th century in the Águilas area. This was used as Don Jorge’s office. The ceremonies room includes a stage, and can hold 70 people: previously the same area was occupied by the family bedrooms. This room leads out onto the porch, and the floor was specially designed and made in Córdoba by one of the few remaining businesses still specializing in this kind of work. The floor in the entrance hall is also worth noting. 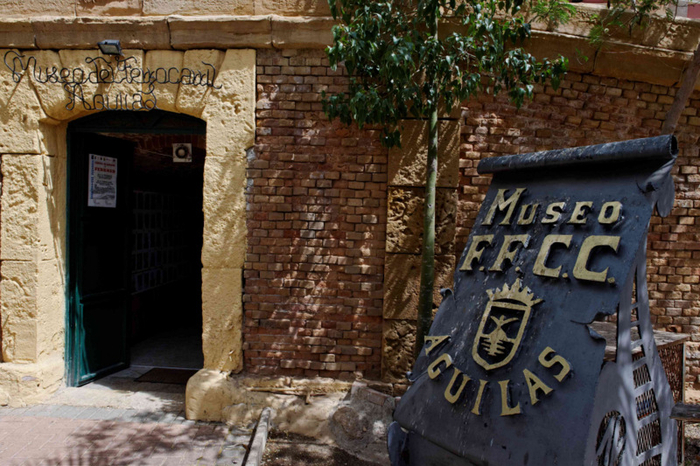 The entrance contains images of the man himself and his family, as well as interesting images of Águilas in the era when it was a residential home. It also has a café, selling drinks, snacks and ice creams. The tourist office run this excursion on the third Sunday of each month and participation is free, although the guide only speaks Spanish. Places are very limited as there is one train which holds 36 people. 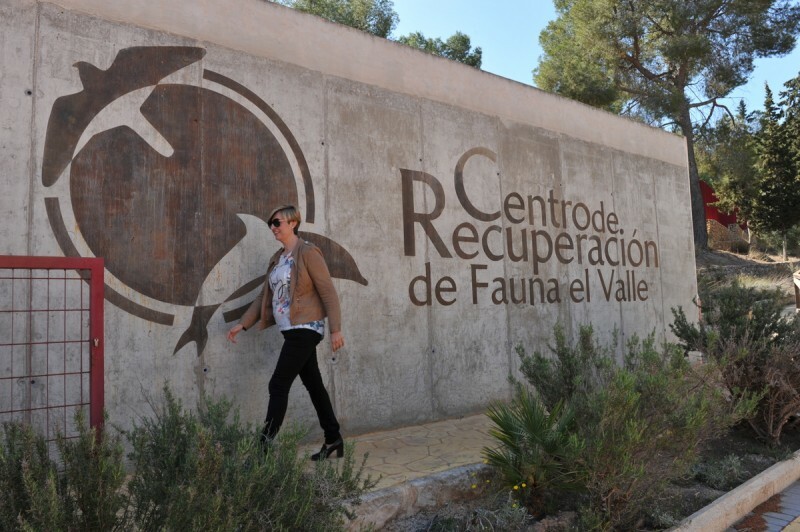 Reservation is essential and can be done by contacting Águilas tourist office on 968 493 285 or via email using the safe contact box in the business directory. 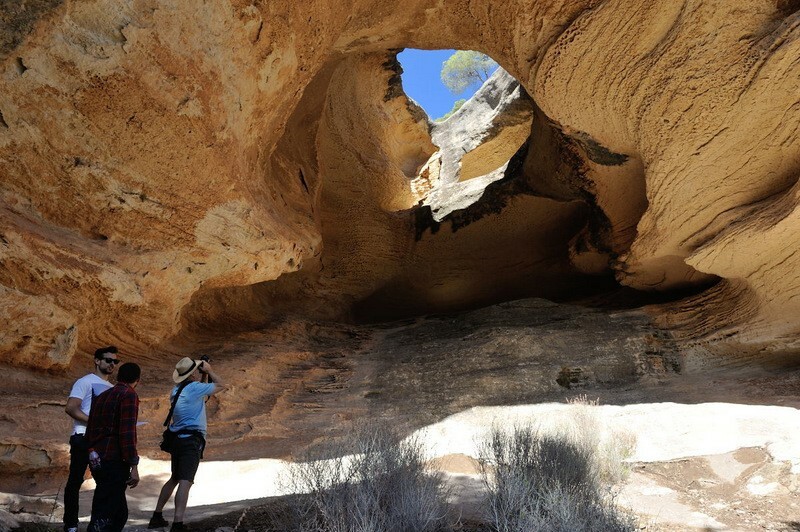 This route is also on offer to private groups. There are 2 options: with tourist train and without tourist train. With train: the train seats 36 people and costs 200 euros to hire, so anyone wanting to book it for the morning will have to ensure they cover the full cost of the train. Without train: the same route can be followed by a coach or minibus, taking out the cost of the tourist train. To offer the route in English, an English speaking tour guide can be provided, but there will be a fee to cover the guide, who is an official, legal tour guide. The Railway Museum is open daily in the mornings and has a small entrance fee of 1 euro to cover the electric. There are no entry fees for the Embarcadero complex, but these can only be opened by prior arrangement by an authorised person for security and insurance reasons. The tourist office in Águilas will be happy to help arrange private group visits for reasonable sized groups, taking into account the above costs, and will also assist in organising a lunch afterwards or overnight accommodation should a group wish to have an overnight stay and spend more time in the area. To contact the tourist office click Águilas Tourist Office for a safe contact box, full details and map.